FIREFLIER LIGHTING supplies high efficiency LED products across the world. We rely on a trusted global network of local LED lighting distributors and wholesalers to ensure that our business operates effectively. As a professional LED Industrial Lighting supplier, we are always looking for ambitious partners who share our business goals and want to become our lighting distributors and wholesalers. The exclusive distributor agreement is concluded for a fixterm of a year. Based on the different levels of a target countries’/regions’ population, a sales target is set to guarantee the mutual benefit of both parties. An amount of 1% of the sales target has to be given as a deposit to make sure the goal(s) are achieved. The supplier will refund the deposit by 1% of goods’ value from every order’s amount, until the deposit is completely returned to the distributor. 1. If the distributor can achieve the goal within a year, the exclusive distribution agreement can be automatically extended by another year without any written notification. 2. If the distributor cannot achieve the goal(s) within one year, the supplier reserves the right to continue the exclusive agreement or not. But in order to cover the loss of the market share for the supplier, the remaining deposit will not be refunded immediately, whether or not the exclusive distribution is renewed or terminated. The remaining deposit can be refunded again by 1% of the sales order amount (when new orders placed), not depending on whether the exclusive distribution is degraded to non-exclusive distribution agreement or not, until it is completely returned by 1% of the sales order amount. Distributorship can be granted without any requirement(s) which is a non-exclusive agreement. (Markets E-F): – A maximum of 8 months of protection period can be granted if goals achieved. – Firstly 3 months of protection period is granted. If a total order amount of US $20,000 or greater is placed during the 3 months’ protection period, this period will be added by a further 5 months upon the 3 month protection period (Altogether 8 months). – If the distributor achieves 10% or greater of total annual sales target within the 8 month period, they will have a priority right to become an exclusive distributor for an extra 12 months. Within this extra 12 months, the distributor needs to reach the annual sales target. – However, after the additional 5 months are added, if the distributor does not reach the 10% of the total annual sales target within 8 months, the supplier reserves the right to re-evaluate if the protection period will be extended or not. – During the protection period, the supplier will not authorize or quote to any new agency and/or customer(s) on this country/region. However, if there are no orders placed within 3 months protection period, the supplier reserves the right to reevaluate and decide if the protection period will be extended or not. (Markets C-D): – A maximum of 8 months of protection period can be granted if goals achieved. – Firstly a period of 3 months of protection period is granted. If a total order amount of US $50,000 or greater is placed during the 3 months’ protection period, this period will be added by a further 5 months upon the 3 month protection period. – If the distributor achieves 20% or greater of total annual sales target within the 8 month period, they will have a priority right to become an exclusive distributor for extra 12 months. Within this extra 12 months, the distributor needs to reach the annual sales target. – However, after the additional 5 months are added, if the distributor does not reach the 20% of the total annual sales target within 8 months, the supplier reserves the right to re-evaluate if the protection period will be extended or not. – During the protection period, the supplier will not authorize or quote to any new agency and/or customer(s) on this country/region. However, if there are no orders placed within 3 months protection period, the supplier reserves the right to re-evaluate and decide if the protection period will be extended or not. (Market A-B): – A maximum of 8 months of protection period can be granted if goals achieved. – Firstly 3 months of protection period is granted. If a total order amount of US $100,000 or greater is placed during the 3 months’ protection period, this period will be added by a further 5 months upon the 3 month protection period (Altogether 8 months). – If the distributor achieves 30% or greater of total annual sales target within the 8 month period, they will have a priority right to become an exclusive distributor for an extra 12 months. Within this extra 12 months, the distributor needs to reach the annual sales target. – However, after the additional 5 months are added, if the distributor does not reach the 30% of the total annual sales target within 8 months, the supplier reserves the right to re-evaluate if the protection period will be extended or not. 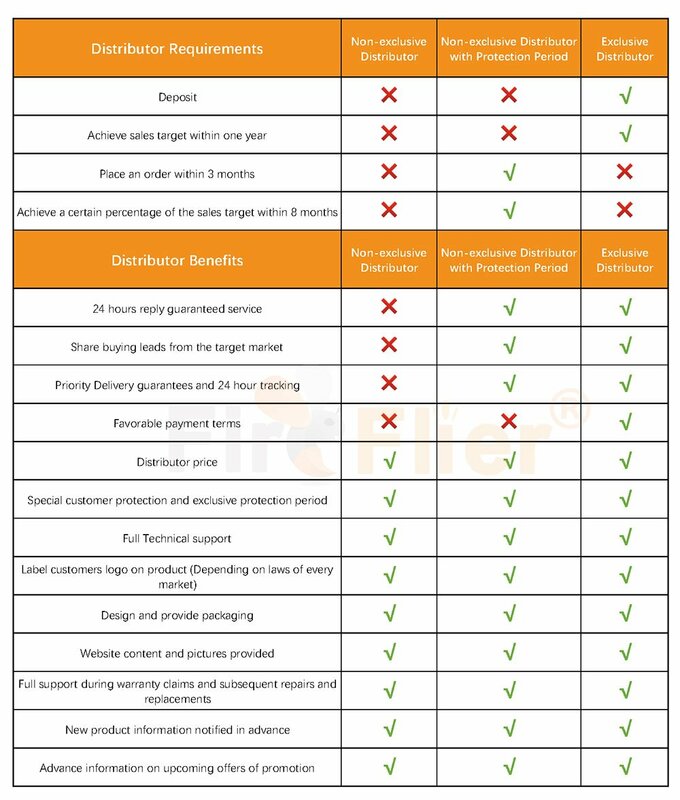 You can also download distributor detail document here DISTRIBUTOR DETAIL REQUIREMENT. FIREFLIER invites entrepreneurs and companies that want to become LED lighting distributors from all over the world. If you have read the 3 ways to become an industrial lighting distributor with us (above section), then, fill below LED distributor inquiry form. Our team will connect with you very soon and answer all your queries about becoming a certified distributor of LED High Bay Lights, Outdoor Lights, LED Corn Bulbs and Vapor Tight Lights.